"Rama X" redirects here. For the ruler of the Kingdom of Cochin, see Rama Varma X.
Maha Vajiralongkorn Bodindradebayavarangkun (Thai: มหาวชิราลงกรณ บดินทรเทพยวรางกูร, RTGS: Mahawachiralongkon Bodinthrathepphayawarangkun, pronounced [māhǎːwát͡ɕʰírāːlōŋkɔ̄ːn bɔ̄ːdīntʰrátʰêːppʰājáwárāːŋkūːn] ( listen); born 28 July 1952) has been the King of Thailand since 2016. [a] He is the only son of King Bhumibol Adulyadej and Queen Sirikit. In 1972, at the age of 20, he was made crown prince by his father. After his father's death on 13 October 2016, he was expected to accede to the throne of Thailand but asked for time to mourn before taking the throne. He accepted the throne on the night of 1 December 2016. His father was cremated on 26 October 2017. His coronation is planned to be held on 4 to 6 May 2019. The Thai government retroactively declared his reign to have begun on 13 October 2016, upon his father's death. As the tenth monarch of the Chakri dynasty, he is also styled as Rama X. Aged 64 at that time, Vajiralongkorn became the oldest Thai monarch to ascend to the throne. The Royal Family, 1966. 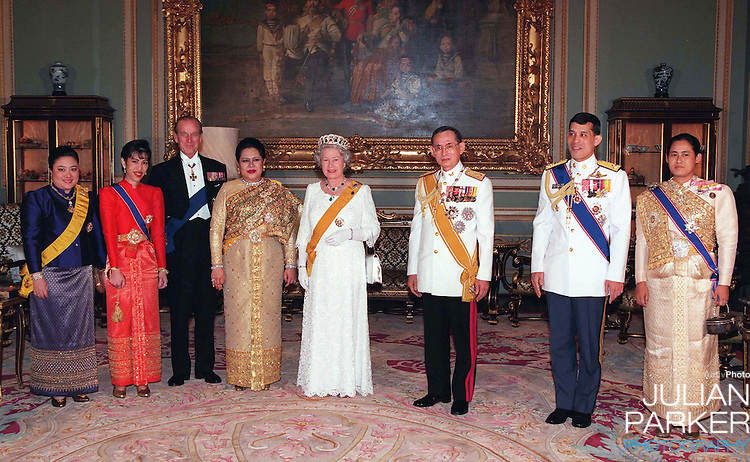 Vajiralongkorn stands at far right. 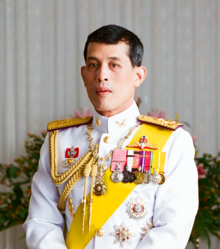 Maha Vajiralongkorn was born on 28 July 1952 at 17:45 in the Amphorn Sathan Residential Hall of the Dusit Palace in Bangkok. When the crown prince was one year old, Somdet Phra Sangkharat Chao Kromma Luang Wachirayanawong, the 13th Supreme Patriarch of Thailand of the Rattanakosin Era, gave the child his first name at birth, "Vajiralongkorn Borommachakkrayadisonsantatiwong Thewetthamrongsuboriban Aphikhunuprakanmahittaladunladet Phumiphonnaretwarangkun Kittisirisombunsawangkhawat Borommakhattiyaratchakuman" (Thai: วชิราลงกรณ บรมจักรยาดิศรสันตติวงศ เทเวศรธำรงสุบริบาล อภิคุณูประการมหิตลาดุลเดช ภูมิพลนเรศวรางกูร กิตติสิริสมบูรณ์สวางควัฒน์ บรมขัตติยราชกุมาร). He is the only son, the second of the four children of King Bhumibol Adulyadej and Queen Sirikit. Vajiralongkorn began his education in 1956, when he entered kindergarten at the Chitralada School in Dusit Palace. After completing Mathayom 1 (grade seven), he was sent to be educated at independent schools in the United Kingdom, first at a prep school, King's Mead, Seaford, Sussex, and then at Millfield School, in Somerset, where he completed his secondary education in July 1970. In August 1970, he attended a five-week military training course at The King's School, in Sydney, Australia. In 1972, the prince enrolled at the Royal Military College, Duntroon in Canberra, Australia. His education at Duntroon was divided into two parts, military training by the Australian Army and a bachelor's degree course under the auspices of the University of New South Wales. He graduated in 1976 as a newly commissioned lieutenant with a liberal arts degree. In 1982 he completed a second bachelor's degree in law with second-class honours at Sukhothai Thammathirat Open University. He had taken up his duties while serving in the Royal Thai Armed Forces, including frequent provincial tours and representing King Bhumibol at a wide variety of official functions and ceremonies before he ascended the throne. On 6 November 1978, the prince was ordained as a monk at Wat Phra Sri Rattana Satsadaram (Temple of the Emerald Buddha), at age 26. As is traditional for royals, he stayed at Wat Bowonniwet Vihara for 15 days and under the monastic name "Vajiralongkornno". US Deputy Secretary of Defense Paul Wolfowitz (right) escorts Crown Prince Maha Vajiralongkorn through an honor cordon and into the Pentagon on 12 June 2003. After completing his studies, Vajiralongkorn served as a career officer in the Royal Thai Army. He served as a staff officer in the Directorate of Army Intelligence and attended the Command and General Staff College in 1977. Vajiralongkorn trained for periods with the US, British, and Australian armed services, studying unconventional warfare and advanced navigation. He is a qualified fixed-wing and helicopter pilot. In 1978 he became head of the King's Own Bodyguard Battalion. Later that year he interrupted his military career to be ordained for a season as a Buddhist monk, as is customary for all Thai Buddhist men. 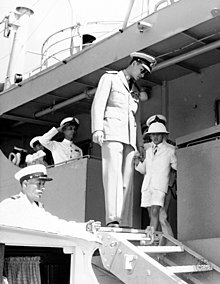 Vajiralongkorn holds the ranks of Field Marshal (Chom Phon) in the Royal Thai Army, Admiral of the Fleet (Chom Phon Ruea) in the Royal Thai Navy, and Marshal of the Royal Thai Air Force (Chom Phon Akat) in the Royal Thai Air Force. 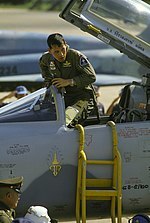 He is qualified to pilot the Northrop F-5 and many other aircraft, F-16, and the Boeing 737-400. His military role in recent years has become increasingly ceremonial. As his father grew older, Vajiralongkorn took a more prominent part in royal ceremonial and public appearances. He officially opened the 2007 Southeast Asian Games, held in Nakhon Ratchasima. The event occurred one day after the 80th birthday of his father. Vajiralongkorn established "Crown Prince Hospitals" through funds donated by the public to serve as medical and health care centers for people living in remote areas. Crown Prince Hospitals had been set up in 21 locations in 1977. These hospitals had become major community hospitals providing services of international standard to the general public in 2011. Also interested in agricultural development, Vajiralongkorn has accepted the "Mobile Agricultural Clinic Project" under his patronage. The project provides prompt services to farmers in order to enhance efficiency in farm production and solve farmers' problems. It provides experts in various agricultural fields who can advise farmers on plants, livestock, fisheries, and land development. He also offers suggestions on the tackling of agricultural problems, in addition to the application of agricultural technology to increase productivity and the improvement in the quality of agricultural production. Mobile Agricultural Clinic teams can move quickly to various spots in need of help. It has worked steadily and is ready to provide technical services and transfer technology. With this project, farmers have been urged to be aware of agricultural development and the application of new technology. In recent years Vajiralongkorn had represented the late King, Bhumibol Adulyadej, in presiding over the annual Royal Ploughing Ceremony, which is meaningful to Thai farmers. Aware of the importance of efficient agriculture for better productivity, Vajiralongkorn emphasized full-cycle agricultural activities, believing they will help improve the quality of life of farmers, who are traditionally considered the backbone of the nation. Vajiralongkorn has initiated education projects with the aim of improving children's access to quality learning and instilling the concept of lifelong learning. He has special ties to the Rajabhat University system of 40 institutions of higher learning. The chairman of the Council of Rajabhat University Presidents of Thailand said that Vajiralongkorn has presided over commencement ceremonies at all Rajabhat Universities nationwide and personally handed out degrees to all Rajabhat university graduates every year since 1978. It is estimated that over the past 35 years at least 2,100,000 degrees have been handed out by the crown prince to Rajabhat graduates. In addition, every year he donates 42 million baht to a scholarship fund benefiting Rajabhat students. Vajiralongkorn was once known as the "Football Prince", but is now renowned for his involvement in cycling. He has also had shown keen interest in other sports since he was young. He learned horseback riding when he was about 11 years old and soon became a capable rider. While studying in Thailand and abroad, he played several sports with friends including football, rugby and rowing. Vajiralongkorn also competed in sailing with King Bhumibol and sister Princess Ubolratana when they were staying at Klai Kangwon Palace in Hua Hin. A fine footballer, Vajiralongkorn first played as a forward and later became a centre-back at Chitralada School, Milfield School in England and the Royal Military College, Duntroon in Australia. His love for sports is obviously in his blood through his late father, King Bhumibol. According to the 2007 Constitution, the cabinet instructed the president of the National Assembly to invite Crown Prince Vajiralongkorn to the throne. He became the first monarch to be born in Thailand since Prajadhipok. After his father, Bhumibol Adulyadej, died on 13 October 2016, Vajiralongkorn was expected to succeed to the throne of Thailand but asked for time to mourn before taking the throne. On the night of 1 December 2016, the fiftieth day after the death of Bhumibol, Regent Prem Tinsulanonda led the heads of the country's three branches of government to an audience with Vajiralongkorn to invite him to ascend to the throne as the tenth king of the Chakri dynasty. Vajiralongkorn accepted the invitation, saying in a televised statement: "I would like to accept in order to fulfil his majesty's wishes and for the benefit of all Thais." The government retroactively declared his reign to have begun upon his father's death, but it would not crown him formally until after the cremation of his father. Currently, his main residence is Amphorn Sathan Residential Hall which moved from Nonthaburi Palace on 2011, and didn't move after his father's death. Following the resignation of the councillors to Bhumibol Adulyadej, Vajjiralongkorn appointed 10 members of the Privy Council. The command was issued under Section 2 of the 2014 interim constitution, completed with Sections 12, 13 and 16 of the 2007 constitution on the king which were retained and remain in effect. The remaining seven members are Surayud Chulanont, Kasem Wattanachai, Palakorn Suwanrath, Atthaniti Disatha-amnarj, Supachai Poo-ngam, Chanchai Likhitjitta and Chalit Pukbhasuk, with three new members, Paiboon Koomchaya, Dapong Ratanasuwan, and Teerachai Nakwanich. Prem Tinsulanonda was re-appointed Privy Council president by royal command. On 13 December 2016, the King appointed two new members, Wirach Chinvinitkul and Charunthada Karnasuta. On 25 December 2016, the King appointed one more new member, Kampanart Rooddit. On 19 January 2017, Privy Councillor Chanchai Likhitjitta died at the age of 71. On 2 Oct 2018, Mr. Ampon Kittiampon, Gen Chalermchai Sitthisad and ACM Johm Rungswang were appointed privy councilors. Thailand's military-backed parliament voted overwhelmingly in January 2017 to make amendments to the interim constitution so as to allow amendments to the draft constitution as suggested by the new king's office. Critics said the new constitution would give the military a powerful political say for years or decades. The 2017 Constitution of Thailand was approved in a referendum in 2016, and was endorsed by King Maha Vajiralongkorn on 6 April 2017, Chakri day, in a ceremony at the Ananta Samakhom Throne Hall. Prime Minister Prayut Chan-o-cha said the office of King Vajiralongkorn had asked for several changes to clauses related to royal power in the draft constitution, a rare intervention by a reigning Thai monarch. After the death of King Bhumibol, political activity was paused during a period of mourning that ended in 2017. In February 2019, in a move called "unprecedented", The King's elder sister, Ubol Ratana announced her candidacy for the Thai prime ministership in the 2019 general election, running as a candidate of the Thaksin-allied Thai Raksa Chart Party. Later that same day, Vajiralongkorn issued an emergency royal decree stating that her candidacy for prime minister is "inappropriate...and unconstitutional". Thailand’s election commission then disqualified her from running for prime minister, formally putting an end to her candidacy. Vajiralongkorn has direct control over the royal household and palace security agencies. Thailand's kings are protected by lèse-majesté laws which allows critics to be jailed for three to fifteen years. After the 2014 Thai coup d'état, Thailand had the highest number of lèse-majesté prisoners in the nation's history. In 2017, the military court in Thailand sentenced a man to 35 years in prison for insulting monarchy on Facebook. There is a strict, and strictly enforced, lèse majesté law in Thailand. Criticism of the king, queen, crown prince, and more recently, former kings, members of the royal family, and even their pets has long been strictly prohibited, with large fines and prison sentences of up to 35 years being imposed. However, Vajiralongkorn's private life continues to be a controversial subject of discussion in Thailand, although not publicly. In the 10 January 2002 edition of the Far Eastern Economic Review (FEER), an article appeared suggesting that Vajiralongkorn had business ties with then-Prime Minister Thaksin Shinawatra. An immediate ban was placed on distribution of the magazine, and the Thai government, citing a threat to national security, suspended the visas of FEER's two Thailand correspondents, Shawn Crispin and Rodney Tasker. In 2002, The Economist wrote that "Vajiralongkorn is held in much less esteem (than the king). Bangkok gossips like to swap tales of his lurid personal life... Besides, no successor, however worthy, can hope to equal the stature King Bhumibol has attained after 64 years on the throne." This issue of The Economist was banned in Thailand. In 2010, another issue of The Economist, also not distributed in Thailand, said that Vajiralongkorn was "widely loathed and feared" and "unpredictable to the point of eccentricity", while the online journal Asia Sentinel said that he was "regarded as erratic and virtually incapable of ruling"; the journal was blocked shortly thereafter. In a diplomatic cable leaked by WikiLeaks, senior Singaporean foreign ministry official Bilahari Kausikan said that Vajiralongkorn had a gambling habit partly funded by exiled former prime minister Thaksin Shinawatra. On 12 November 2009, a home video was released to WikiLeaks, showing Vajiralongkorn casually dressed and Princess Srirasmi wearing only a G-string, all the while being attended to by several formally dressed servants, celebrating the birthday of the prince's poodle, Air Chief Marshal Fufu. Part of this video was broadcast on the "Foreign Correspondent" programme on the Australian government's ABC TV channel on 13 April 2010, as part of a half-hour documentary critical of the royal family of Thailand. On 19 January 2009, Harry Nicolaides, an Australian national, was sentenced to three years in prison for self-publishing a fictional book deemed to have committed lèse majesté. The offending passage alluded to rumours that "if the prince fell in love with one of his minor wives and she betrayed him, she and her family would disappear with their name, familial lineage and all vestiges of their existence expunged forever". Nicolaides was later pardoned by the king. Nicolaides later stated that "it's entirely fiction from cover to cover". In August 2011, the German judicial authorities in Munich impounded an aircraft, a Boeing 737, one of two belonging to Crown Prince Vajiralongkorn. Administrators seized the aircraft because of a 20-year-old Thai government debt owed to a now-defunct German construction corporation for the Don Mueang Tollway, that had risen to some €30 million. German authorities, representing the corporation's interests in bankruptcy, stated the measure was a "last resort" in seeking repayment. The Thai government, which had not responded to German demands, called the move "highly inappropriate". On 1 August, Vajiralongkorn's office announced he would pay the deposit amounting to €20 million himself. One day later the Thai foreign minister Kasit Piromya confirmed that the Thai government would pay the deposit. In November 2016, Manager Magazin published a report stating that the new king could be issued with an inheritance tax bill in excess of €3.5 billion. According to the report, the new King is domiciled in Bavaria where he owns two villas and spends most of his time, which makes him subject to local inheritance tax. On 16 May 2017, Thai officials warned Facebook after an online video was posted of the king wearing a crop top and with full view of his half sleeve tattoo. Imgur, the online image-sharing community and image host, has had many users pushing for the Google algorithm to be changed as this blocks such searches. 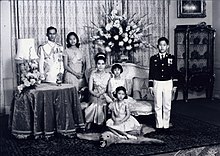 On 3 January 1977, Vajiralongkorn married Princess Soamsawali Kitiyakara (born 1957), a first cousin on his mother's side. They had one daughter, Princess Bajrakitiyabha, born in 1978. Crown Prince Vajiralongkorn started living with actress Yuvadhida Polpraserth in the late-1970s and had five children with her. Although Princess Soamsawali had refused divorce for many years, Vajiralongkorn was finally able to sue for divorce in the Family Court in January 1993. In the court proceedings, Vajiralongkorn accused Princess Soamsawali of being completely at fault for the failed relationship. She was not able to refute the charges due to the prohibition against lèse majesté. The divorce was finalized in July 1993. Princess Soamsawali and her daughter continue to play a significant role in royal ceremonies. When Vajiralongkorn was introduced to Yuvadhida Polpraserth, she was an aspiring actress. She became his steady companion and gave birth to his first son, Prince Juthavachara Mahidol, on 29 August 1979. He later had three more sons and a daughter by her. They were married at a palace ceremony in February 1994, where they were blessed by the King and the Princess Mother, but not by the Queen. After the marriage, she was allowed to change her name to Mom Sujarinee Mahidol na Ayudhaya, signifying she was a commoner married to royalty. She was also commissioned as a major in the Royal Thai Army and took part in royal ceremonies with Vajiralongkorn. 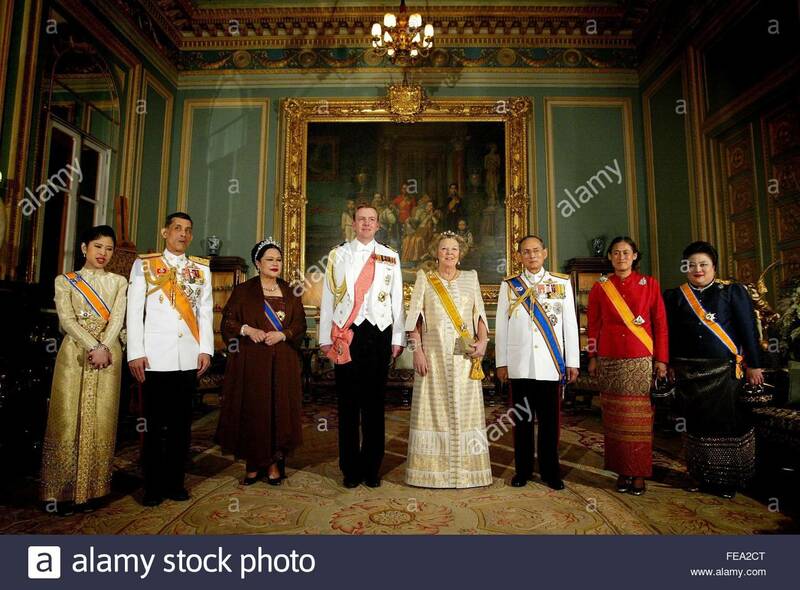 In 1996, two years after the wedding, Mom Sujarinee (as she was now known) decamped to Britain with all her children, while Vajiralongkorn caused posters to be placed all around his palace accusing her of committing adultery with Anand Rotsamkhan, a 60-year-old air marshal. Later, the prince abducted the daughter and brought her back to Thailand to live with him. She was later elevated to the rank of princess, whilst Sujarinee and her sons were stripped of their diplomatic passports and royal titles. Sujarinee and her sons moved to the United States, and as of 2007, she was known as Sujarinee Vivacharawongse. Vajiralongkorn married a third time on 10 February 2001, to Srirasmi Suwadee (royal name: Akharaphongpreecha), a commoner of modest background who had been in his service since 1992. The marriage was not disclosed to the public until early 2005. She gave birth to a son, Prince Dipangkorn Rasmijoti, on 29 April 2005 and was then elevated to the rank of princess. Her son was immediately elevated to the rank of prince. In a magazine interview, Vajiralongkorn stated his intention to settle down. In November 2014, however, Vajiralongkorn sent a letter to the interior ministry asking for Princess Srirasmi's family to be stripped of the royal name Akharaphongpreecha awarded to her, following allegations of corruption against seven of her relatives. The following month, Srirasmi relinquished her royal titles and the royal name and was officially divorced from Vajiralongkorn. She received 200 million baht (US$5.5 million) as a settlement. They had been married for 13 years. 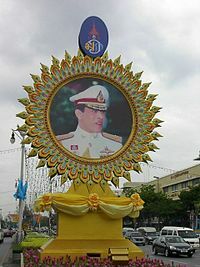 Wikimedia Commons has media related to Vajiralongkorn. ^ a b On 1 December 2016, Vajiralongkorn accepted the formal invitation to become king. He was declared king retroactively to the day of his predecessor and father's death on 13 October 2016. Prem Tinsulanonda acted as regent from that date. ^ a b "Vajiralongkorn ascends the throne as King Rama X". Khaosod English. 2016-12-02. Retrieved 2016-12-02. ^ Paddock, Richard (1 December 2016). "New King for Thailand as Crown Prince, Vajiralongkorn, Ascends to Throne". The New York Times. Retrieved 2 December 2016. ^ a b "King Rama X Maha Vajiralongkorn". globalsecurity.org. ^ a b "Thai Prime Minister Prayuth says Crown Prince seeks delay in proclaiming him King". Coconut.co. Bangkok: Coconuts BKK. AFP. 2016-10-13. Retrieved 2016-10-14. ^ Holmes, Oliver (26 October 2017). "Thailand grieves over former king at lavish cremation ceremony". The Guardian. ^ a b c d "Thai king's coronation likely by the end of 2017: deputy PM". Reuters. 21 April 2017. Retrieved 13 June 2017. ^ Shawn W. Crispin, How stable is post-cremation Thailand?, Asia Times (December 6, 2017). ^ "Coronation of HM King Maha Vajiralongkorn to be held May 4-6: palace". The Nation. Retrieved 2019-01-01. ^ Paddock, Richard C. (2016-12-01). "New King for Thailand as Crown Prince, Vajiralongkorn, Ascends to Throne". The New York Times. ISSN 0362-4331. Retrieved 2017-10-22. ^ a b "Long Live the King: Childhood". Bangkok Post. 1 December 2016. Retrieved 3 December 2016. ^ "Old Millfieldian Society – Overseas Branch Officials". Omsociety.com. Retrieved 2016-12-01. ^ a b c d e "Long Live the King: Military Education". Bangkok Post. 1 December 2016. Retrieved 3 December 2016. ^ "Set to fulfil his destiny". Bangkok Post. Retrieved 30 November 2016. ^ "Long Live the King: the Upholder of Religions". Bangkok Post. 1 December 2016. Retrieved 3 December 2016. ^ "Crown Prince is a qualified military pilot". Straits Times. 2016-11-30. Retrieved 3 December 2016. ^ "Southeast Asian Games Open in Thailand". Voice of America. Retrieved 2 December 2016. ^ Lines, Chris. "Burma Wins Silver at Southeast Asian Games". The Irrawaddy. Associated Press. Retrieved 2 December 2016. ^ a b c d "BIRTHDAY CELEBRATION OF HIS ROYAL HIGHNESS CROWN PRINCE MAHA VAJIRALONGKORN". Royal Thai Embassy to Singapore. Retrieved 19 December 2016. ^ a b Mala, Dumrongkiat (1 December 2016). "Crown Prince: Education key to progress". Bangkok Post. Retrieved 1 December 2016. ^ Kershaw, Roger (2001). Monarchy in South-East Asia: The faces of tradition in transition (1st ed.). London: Routledge. pp. 152–153. ISBN 0415243483. ^ "Crown Prince becomes King". Bangkok Post. Retrieved 1 December 2016. 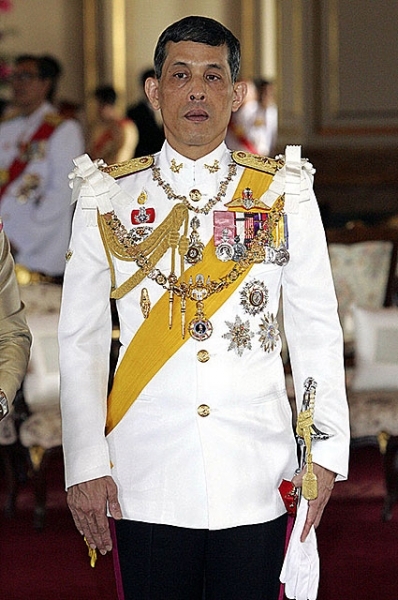 ^ a b "Thai Crown Prince Maha Vajiralongkorn proclaimed king". BBC News. 2016-12-01. Retrieved 8 May 2018. ^ "Crown prince Vajiralongkorn becomes Thailand's new king". Aljazeera. Retrieved 2 December 2016. ^ "New Thai king receives Japanese emperor". Nikkei Asian Review. Retrieved 9 April 2017. ^ "King appoints 10 members to his Privy Council". Bangkok Post. Retrieved 6 December 2016. ^ "King appoints two new privy councilors". Thai PBS. Retrieved 19 December 2016. ^ "Former assistant army chief appointed Thailand's new privy councillor". Xinhua News Agency. Retrieved 25 December 2016. ^ "Privy Councillor Chanchai Likhitjitta dies". The Nation. Retrieved 19 January 2016. ^ "King signs to promulgate new Constitution". Nation Multimedia Group. 6 April 2017. Retrieved 6 April 2017. ^ "Thai parliament approves king's constitutional changes request, likely delaying elections". Reuters. Retrieved 13 January 2017. ^ Withnall, Adam (2019-02-08). "Thai princess joins election race to become prime minister in stunning move for 'apolitical' royals". The Independent. Retrieved 2019-02-08. ^ "Thai king says sister's candidacy for prime minister is 'inappropriate', 'unconstitutional': Palace statement". Channel NewsAsia. 8 February 2019. Retrieved 2019-02-09. ^ Jett, Jennifer (2019-02-11). "Thai King's Sister Is Formally Barred From Running for Prime Minister". The New York Times. ISSN 0362-4331. Retrieved 2019-02-12. ^ "Thai king takes control of five palace agencies". businesstimes.com.sg. Retrieved 18 May 2017. ^ Champion, Paul (25 September 2007). "Professor in lese majeste row". Reuters. Archived from the original on 13 October 2007. ^ 2014 coup marks the highest number of lèse-majesté prisoners in Thai history. Prachatai. ^ a b "Thailand jails man for 35 years for insulting the monarchy on Facebook". The Independent. 10 June 2017. ^ Erin Hale (30 November 2016). "4 Facebook Posts That Can Get You Arrested In Thailand; section Make fun of the King's dog; fined 500,000 baht with 86 days in prison". Forbes. Retrieved 13 June 2017. ^ "As father fades, his children fight". The Economist. 18 March 2010. ^ Dorling, Philip; McKenzie, Nick (12 December 2010). "Top Singapore officials trash the neighbours". The Sydney Morning Herald. ^ "Suppressed video of Thai Crown Prince and Princess at decadent dog party". WikiLeaks. ^ Rayner, Gordon (4 February 2011). "WikiLeaks cables: Thailand's royal pet". The Daily Telegraph. Archived from the original on 7 January 2014. Retrieved 7 January 2014. An experienced diplomat should be able to greet anyone from a king to a despot, but nothing could prepare one US ambassador for the experience of meeting a military officer that happened to be a poodle. 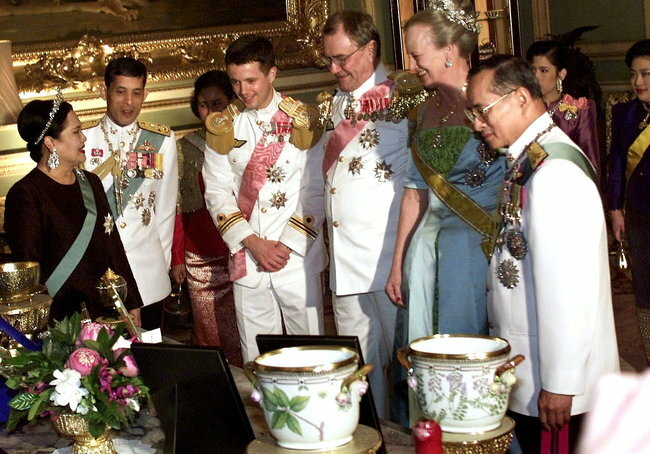 ^ "WikiLeaks cables reveal scandal and disease in Thai royal family". The Australian. 24 June 2011. Retrieved 18 February 2012. ^ "Foreign Correspondent". Abc.net.au. 2012-07-31. Retrieved 2017-01-10. ^ "Thailand frees Australian writer". BBC News. Retrieved 29 November 2016. ^ Australian Writer Who Insulted Thai Monarchy Shares Prison Cell With Child Molester, Weapons Dealer, Huffington Post, 22 February 2009. ^ "Thai Aircraft List29022555.xls". Department of Civil Aviation. Archived from the original on 28 January 2015. Retrieved 24 January 2015. ^ "Germany Impounds Thai Prince Vajiralongkorn's Jet". BBC Online. 13 July 2011. Retrieved 14 July 2011. ^ "Plane stupid: the damage is done". The Nation. 19 July 2011. Archived from the original on 22 July 2011. Retrieved 20 July 2011. The Royal Thai Air Force (RTAF) confirmed the Thai government's contention that the RTAF in 2007 presented the Boeing 737 jet to the Prince for his personal use. ^ "Is the dispute with Walter Bau coming to an end?". Bangkok Pundit. 2 August 2011. Retrieved 2 August 2011. ^ "Bayern hofft auf Milliarden von Thailands Kronprinz". Manager Magazin. 2016-11-17. Retrieved 18 May 2017. ^ Ives, Mike; Mozur, Paul (16 May 2017). "Thailand Warns Facebook After Video Seems to Show King in Crop Top". New York Times. Retrieved 18 May 2017. ^ a b "Thailand's new king in profile". BBC. Retrieved 1 December 2016. ^ "Thailand crown prince strips wife's family of royal name". BBC News. 29 November 2014. Retrieved 2 December 2014. It comes after seven of her close relatives were arrested in a purge of officials allegedly involved in corruption. ^ "Photographic image" (JPEG). Capelino.com. Retrieved 2017-01-10. 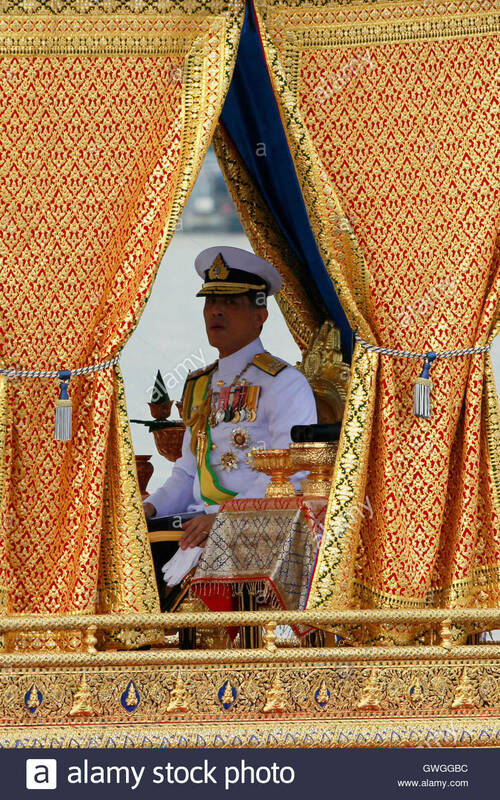 ^ "Photographic image : Thai Crown Prince Maha Vajiralongkorn Sits on the Royal Barge" (JPG). C7.alamy.com. Retrieved 2017-01-10. ^ "Photographic image" (JPG). B.bimg.dk. Retrieved 2017-01-10. ^ "State Banquet for the Malaysian King in Bangkok". 4 September 2013 – via YouTube. ^ "Semakan Penerima Darjah Kebesaran, Bintang dan Pingat". Istiadat.gov.my. 2016-01-20. Retrieved 2017-01-10. ^ "Photographic image : Fiancee of Crown Prince Maha Vajiralongkorn" (JPG). C7.alamy.com. Retrieved 2017-01-10. ^ "Photographic image" (JPG). Cdn3.i-scmp.com. Retrieved 2017-01-10. ^ "Boletín Oficial del Estado" (PDF). Retrieved 2016-12-01. ^ "Photographic image : Thai Banquet" (JPG). Cdn.c.photoshelter.com. Retrieved 2017-01-10. Handley, Paul M. (2006). The King Never Smiles. Yale University Press. ASIN B0015GUOPY. Head, Jonathan (2016-10-16). "Thai king's death: Who holds power now?". BBC. Retrieved 2016-10-16.